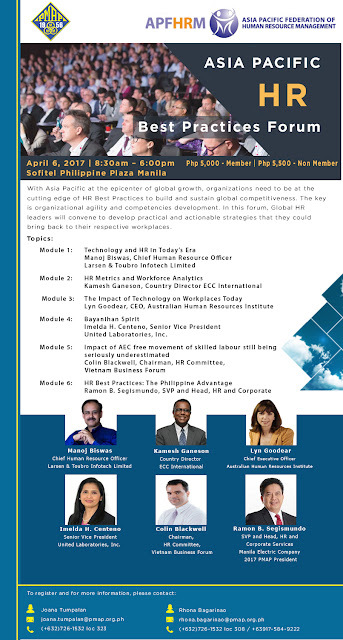 The People Management Association of the Philippines (PMAP), in partnership with Asia Pacific Federation of Human Resource Management (APFHRM), will hold the “Asia Pacific HR Best Practices Forum” at Sofitel Philippine Plaza Manila on April 6, 2017. The APFHRM is an organization with membership from different human resource associations from different countries within the Asia Pacific region and one of its members, PMAP, will host this year’s forum about Human Resource’s best practices in building and sustain global competitiveness. Global HR Leaders will convene to talk about practical development and actionable strategies needed by members into their respective work places. Learn from the line-up of different topics about development and practices of different HR Leaders: “Technology and HR in Today’s Era” by Manoj Biswas, Chief Human Resources Officer of Larsen & Toubro Infotech Limited; “HR Metrics and Workforce Analytics” by Kamesh Ganeson, Country Director ECC International; “The Impact of Technology on Workplaces Today” by Lyn Goodear, CEO of Australian Human Resources Institute; “Bayanihan Spirit” by Imelda H. Centeno, Senior Vice President of United Laboratories, Inc.; “Impact of AEC free movement of skilled labour still being seriously underestimated” by Colin Blackwell, Chairman of the HR Committee of Vietnam Business Forum; and “HR Best Practices: The Philippine Advantage” by Ramon B. Segismundo, SVP and Head and Corporate Services, of Manila Electric Company and 2017 PMAP President. The forum is open to the public and guarantees an interesting and relevant learning journey about HR best practices from leading practitioners in the human resource management from around the world. Investment fee is Php5,000.00 for PMAP members and Php5,500.00 for non-members. For more information, please contact Joana Tumpalan or Rhona Bagarinao at telephone nos. (+632) 726-1532 loc 323 or 308, mobile no. +63917-584-9222 or email at joana.tumpalan@pmap.org.ph or rhona.bagarinao@pmap.org.ph.